The chinese word "ping ann" carries a scope broader than "safety". It means secure, sound, risk-free, low-risk, riskless, impregnable, unassailable and invulnerable. 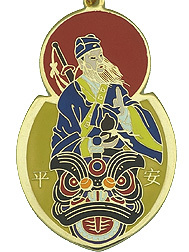 Lu Dong Pin is an immortal and a legendary being of Taoist sect, said to have lived at various times and attained immortality through his studies of Taoist magic. He periodically reappears on earth to help bless families with positive energy, cure diseases, ward off evil, bring good fortune and prevent disasters. Possessing powerful magic to subdue evil, Lu Dong-Pin uses a sword to overcome evil spirits and slice through all types of bad energies. He also holds the fly whisk which he uses to cure illnesses caused by dark realms. 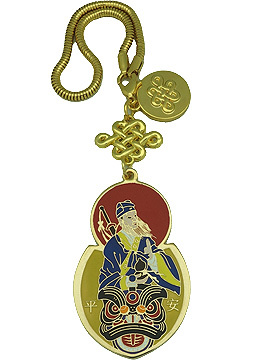 Carrying his amulet is equivalent to having someone who lends an unseen but beneficial helping influence to remove all feng shui "poisons" magically and safeguard you from misfortunes. He bestows safety against premature death and offers supreme protection against all forces that threaten your safety. On the other hand, the lion is associated with military strength and hunting prowess and a powerful symbol that protects against any annual storm. 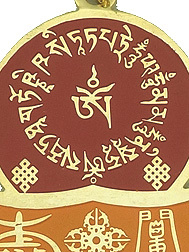 Next, the crossed vajra which is also known as the 'universal' vajra symbolizes the principle of absolute stability. 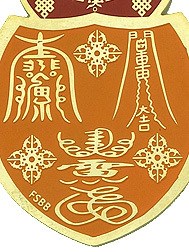 A powerful symbol of indestructability and a powerful implement of many famed Buddhist deities, it is the emblem that represents the unshakeable ground or reality of the Buddha's enlightenment. 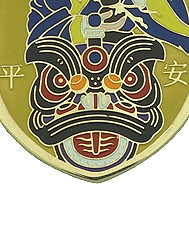 The four heads can each represent the power of pacifying, enriching, subjugating and destroying. This strong metal instrument is believed to possess spiritual cosmic powers that are strong enough to suppress evil in a way that makes it unable to harm you. It provides protection against disasters, mishaps, dangers and accidents caused by underlying supernatural realms. It wards off all odds, terrorism, misfortune, devastation from unlucky stars and annual afflictions. Auspicious energies will be at work creating an invisible aura of protection. Also inscribed is the mantra of White Umbrella Goddess. The powerful Buddha of Protection who carries a white umbrella has the power to symbolically dispel any evil intentions of people who may want to hurt you. Be mindful that everyone is vulnerable to jealous intentions of unscrupulous people, enemies or competitors, so it is better safe than to be sorry. This mantra can also ward off black spells casted by the underlying currents of jealousy and making them harmless. It fights against illnesses caused by black magic and mysterious sicknesses due to dirty energy. 1. 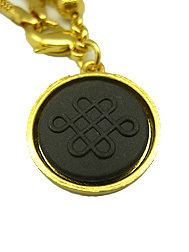 Charm that removes mishaps, disasters, accidents and negativities. 2. Charm that enables travel to be safe and unharmed. 3. Charm that blesses one with safety on the road. 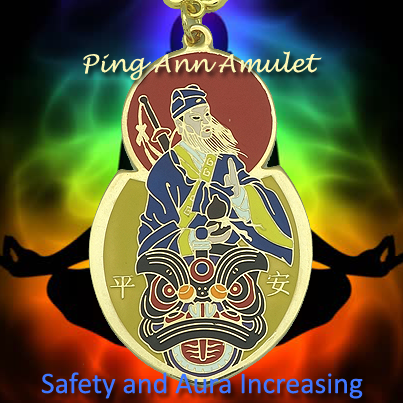 The amulet will boost vitality so that you will not be easily vulnerable to spirit harm which can cause you a troubled, quarrelsome, hostile, sick and injury prone life. You can carry along the amulet, hang it on your bag, hang it at your bedroom's door knob or hang it inside your car. 1. Protect everyone against dirty energy or possible negative spirits and influences from haunted places such as old mansions, hotels, work places, forests or graveyards. It diminishes ghostly attempts and powerfully dissipates any evil energy charging over you. 2. Protect kids/teenagers from succumbing to illnesses and ghostly possession caused by unintended actions or speech that hurt evil spirits. 3. Helps those with suppressed aura. It increases chakra vibes and brighten your aura for those whose life force and spirit essence is low. If not remedied, a person with weak life force and spirit essence are more vulnerable to the year's afflictions and to the negative feng shui winds. Remember that obstacles will keep manifesting unless you successfully subdue them by increasing your aura power. 4. Removes storms and hiccups in your career, wealth, health and relationship. They will eventually become more promising and good luck winds will start to blow to your direction again. 5. Provides protection against injuries, bloodsheds, mishaps, dangers and accidents. 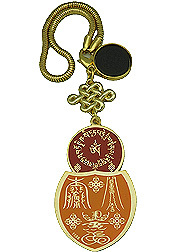 This amulet if kept in your car can also protect you from bad spirits so that one can enjoy safe journeys at all times. 6. Provides safety to those whose zodiac forecast or personal 8 Characters chart hinting the looming of negative stars that indicate danger and injuries in the upcoming year. 7. Reverses bad luck for those whose zodiac forecast hint that you are vulnerable to misfortune. How does your aura get suppressed? When a person experiences suppressed aura, you will fail to radiate with bright energy. The aura is usually suppressed when ones life force and spirit essence is weak. This can be due to a few reasons, such as the down cycle of an individual's fortune, pesky stars appearing in ones annual zodiac luck, poor feng shui of the surrounding and absorbing bad energies from "yin" places(hospital/funeral parlors/graveyards etc). Radiance and vitality is low. An invisible form of "dark cloud" will be encircling your forehead which is not tangible to untrained eyes. Reacting negatively to almost everything, it blocks you from reaching the peak and prevents you from achieving anything fruitful. Your instincts no longer give success. Failures and troubles arise from every aspect of your life. Everything seems unfavorable and unlucky. At its peak, you will suffer from lethal and hostile killing forces. 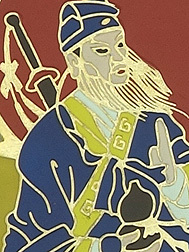 Lu Dong-Pin is the 3rd immortal from the famous Eight Immortals, who uses a sword to overcome evil spirits and slice through bad energies. The sword was given to him by a dragon. He also holds the fly whisk which he uses to cure illnesses. He also blesses scholastic luck to the family. His animal is tiger. He learnt Taoism magic from the chief Chung Li Chuan in AD750 and attained immortality at the age of 50. He had successfully rid the world with his sword from various forms of evils for over 400 years and still visits earth till today. Taoist mediums can communicate with him through meditative means and his image at home will ward off any evil spirits. His direction is West and metal element.